Merging multiple photos can produce amazing photos from ordinary looking images. This can achieved in Photoshop application by playing around with different image layer. However, everyone is not comfortable or has know how to work in Photoshop. 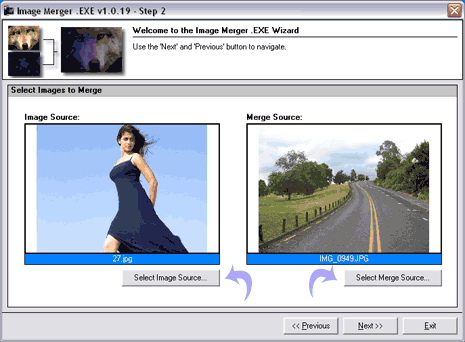 Image Merger is a free and very easy to use alternative for merging and super imposing multiple images. 1. Download Image Merger app & install it on your computer. 2. Launch the application and then select first option “Create new image by merging images together” and click on “Next” button. 3. Now click “Select Image Source” button to select 1st image and then click “Select Merge Source” button to select 2nd image. Then click “Next” button. 4. Select “Merge Style” and “Merge Size” from options in respective drop down boxes. Move the slider to chose intensity. Then click “Next” to finally save your newly created merged or super-imposed image. You can create amazing merged image by selecting different merge styles like addictive, subtractive, darker, lighter, super impose from left to right and many more. It also support batch merge upload but normal mode is more exciting to create cool merged photos in few simple clicks. Try out, its addictive!